A gathering of Egyptian activists and bloggers convened Sunday in Dokki, Cairo to take part in the first ‘Tweet Nadwa’, a meeting organised for members of the social networking and micro-blogging service Twitter “to engage in new conversations and discover new contacts” according to organiser Alaa Abd El Fattah. El Fattah qualified, however, that the meeting was “not a replacement for the street; the fact of the matter is [Twitter] is present and it’s growing.” The meeting, as outlined, was meant as an extension of the many 140-character-message discussions taking place in the Twitter-verse on a daily basis. The discussion focused on the subject of youth Islamists, bringing several such activists to speak and participate, including Ibrahim Hudhaibi, Abdel-Moneim Mahmoud and Ahmed Samir. The form of debate and discussion interestingly took elements from the Twitter-verse as El Fattah limited speakers to 140 seconds -- recalling the 140 character message format of Twitter -- and asked attendees to cease clapping, instead they were told to wave their hands in silence in order for the conversations to flow uninterrupted. The debate itself, which brought activists from a vast stretch of the political and religious spectrum, was carried out in good humour and allowed many diverse voices a stage to air their views. The second half of the ‘Tweet Nadwa’ consisted of an open round of discussion, encouraging members from the floor to speak to each other. El Fattah stressed that members should speak to each other as people with beliefs that might not necessarily echo or represent certain political parties and movements on the outside. The remark ignited a storm of remarks, leading to the poignant question: “What would an Islamist state look like?” Conversation bounced to and fro, as Islamist activists said they just wanted a state that would allow them to continue their religious duties and practices while others argued that the military council, the de-facto rulers of Egypt in the interim, were the main problem as they were creating divisions between all groups in the country. Others attacked Islamists for using religion and the fear of eternal punishment to gather followers and voters, citing the often criticised methods used during the constitutional referendum in March. As the question drifted further and further away, El Fattah restated the, perhaps forgotten, question: “Without looking down at our feet, let’s look forward and envision the perfect state; I myself don’t want a state but I know that isn’t possible; instead I must focus on the steps that might lead me there; what steps are needed to build this state.” It was perhaps the biggest question of the evening, the elephant in the room. Islamists and non-Islamists alike brought up early 20th century Islamist thinkers such as Rashid Reda and Mohammed Abdu, dancing around the issue and in the end leaving it wholly unanswered. The meeting, in the eyes of many, was a success. Twitter users flooded the ‘Tweet Nadwa’ page with appreciative words, pleased that such a meeting could occur and that such a wide range of views could be expressed so amicably and humorously. 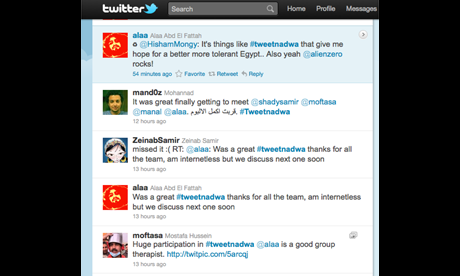 As the attendees left, it seemed clear that another ‘Tweet Nadwa’ was sure to follow: “Was a great #tweetnadwa thanks for all the team, am internetless but we discuss next one soon,” stated El Fattah (aka @alaa) as the participants retreated to the Twitter-verse. All in all was a great success, good to see faces rather than letters in a short phrase. Next time I wish to discuss what to do to have egyptian people to our side in the battle to save 25th of Jan. revolution and organization for the big day Juli the 8th.